In this pioneering investigation, Joseph Yacoub, Ph.D., engages in combat to revive the recent history of the Assyrian people - a nation which suffered severe persecution under the Ottoman Empire and Persia for centuries. The pages ahead offer both facts and comments, analyzing the situation of the Assyrians in the context of world War I and politico-diplomatic movements (Paris Peace Conference, Treaty of Sèvres, Treaty of Lausanne, League of Nation's activities0, beginning with the massacres of 1914-18, including the ones perpetrated by the Iraqi government in August 1933, to their present crucial situation. Yet more importantly, the author's main purpose is to reopen the Assyrian Question before the International Organizations (United Nations, Council of Europe, European Parliament) for the recognition of genocide committed against the Assyrians, and, attempts to lead his compatriots toward preliminary actions to recover their despoiled national rights. 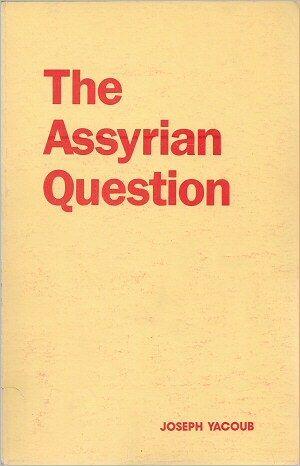 In addition, he provides the reader with a stimulating explanation regarding the Assyrian Genocide by assembling much of the best testimony — unearthed until today — and intends to remind the civilized world of the extent the Assyrian people have suffered during the period covered in the book, and how easily the whole tragedy has been forgotten. Much of the evidence herein has been collected during the past decade by extensive research and in-depth studies of books, manuscripts and interviews, along with a plethora of information extracted from a multitude of diplomatic archives and documents.